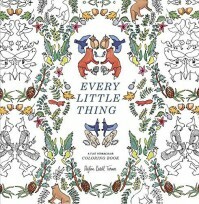 I received a copy for of this coloring book from Blogging For Books. The fact that you can remove the cover of this paperback and color the images on the cover was a great plus, but other than a few pages that offered a form of tessellation, the book wasn't a great one. For the most part, the images look like something a child would draw and the parent would feel obligated to hang it up on the refrigerator. At a price of $15.99 (the price recommended on the book itself, although I have seen it for less), it is not worth the money. I am giving it three stars because there were a handful of pages that were very nice- I just did not care for the style of most of them. It isn't a book I would suggest that you buy unseen. Go to a bookstore or craft store and look at it carefully to make sure the style gels with your wallet and style.